Your IRA (Individual Retirement Account), is a significant part of your retirement plan. Georgetown Trust offers you the same self-directed IRA opportunity the wealthy have been taking advantage of for decades. A Self-Directed IRA is an individual retirement account that is offered by some financial institutions in the Unites States to allow the IRA owner the opportunity to invest in non-standard investment opportunities, even those outside the United States. Real estate, private stock purchases, agricultural projects, precious metals and intellectual property are all examples of alternative investments. However, before purchasing any investment, the IRA custodian must still approve the specific investment’s acquisition on behalf of the IRA owner. 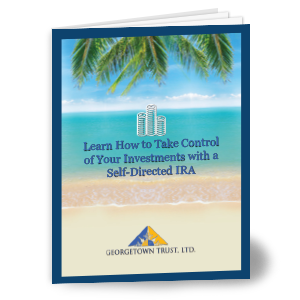 Complete the form on the right to download the free guide "Learn How to Take Control of Your Investments with a Self-Directed IRA" and get help moving your IRA offshore to Belize.